MR. & MRS. CLEAN LIVE HERE! Absolutely SPOTLESS 1 year young "Morningstar" home in family friendly "Robertson Heights" situated right across the street from Park. From the moment you walk into this Open Plan you will fall in Love. Soaring 10 ft ceilings, glass stair rails, gleaming wood floors, granite island kitchen with S/S appliances ideal for entertaining. 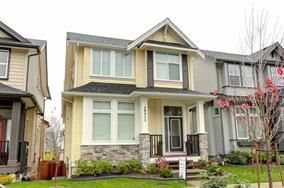 Upstairs are 3 large bedrooms, including gorgeous master with vaulted ceilings and bathed in natural light. The fully finished daylight basement has separate entrance and wet bar for easy swap-over to kitchen for a fully self contained one bedroom mortgage helper. Fenced and private yard and detached double garage off lane.